Slag dryer or slag drying machine is composed of cylinder, blowing equipment, high speed scattering equipment and lifting board also called rotary dryer. It is designed reasonably and perfect in workmanship with stable performance, advanced process and high production, low energy consumption, less spacing and high degree of mechanization. Slag dryer is widely used in building materials, metallurgy, mineral processing, chemical industry and cement industry, for drying slag, carbide slag, limestone, clay, kaolin, bentonite, silicon carbide powder, manganese ore, petroleum coke and other materials. Slag drying machine uses new type of feeding and discharging devices, which puts an end to the uneven feeding jams and discontinuous return of slag drier, and reduces the dust load on the system. Innovation on the internal structure is implemented, which strengthens the cleaning and heat transfer of decentralized materials, and eliminates the dip-sticking to the cylinder wall. 1. Large capacity; high overload resistance; high thermal efficiency, coal cost can be reduced by 20%, directly reduce drying costs. Transmission gear pin can be used to change gear, instead of traditional cast steel gear, saving cost and greatly reducing maintenance costs and time. 2. In order to achieve the best drying effect, downstream drying methods are adopted. Materials and heat flow enter into the slag drying machine from the same side, and the outlet of granulating slag dryer has low temperature and high heat efficiency. 3. Innovation in its internal structure and intensify cleaning of disperse materials and thermal conduction, eliminating the adhesion phenomenon of the cylinder wall. 4. The use of a new type of feeding and nesting devices puts an end to the slag drier uneven feeding jams, discontinuous, and phenomena such as returns, reduces the load of dust-removal system. The equipment lifting devices on the system for a wide range of technological innovations, especially using new combined lifting device, overcomes the dryer’s "wind tunnel". 5. Slag dryer can meet the needs of different users of the slag dried material, such as particle size and moisture requirements. Slag drying machine uses new type of feeding and discharging devices, which puts an end to the uneven feeding jams and discontinuous return of slag drier, and reduces the dust load on the system. Innovation on the internal structure is implemented, which strengthens the cleaning and heat transfer of decentralized materials, eliminating the dip-sticking to the cylinder wall. 1. Slag is sent to hopper through belt conveyor or bucket conveyor, and then charger enters into feeding end through feeding pipe. 2. 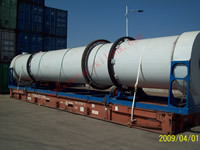 Indication of feeding pipe should be more than crater angle of material so that material is smoothly flowed into dryer. 3. Dryer cylinder is slightly leaned to horizontal line. Material is added from upper end, while heat-carrying agent is entered from lower end, forming counter-current contact with material. Sometimes heat-carrying agent and material are flowed into barrel. 4. With rotation of cylinder, material runs to upper end upper gravity action. When moist material is moved forward in barrel, it directly and indirectly gained supply of heat-carrying agent so that moist material can be dried and sent through belt feeder or screw conveyor in discharging end. 5. 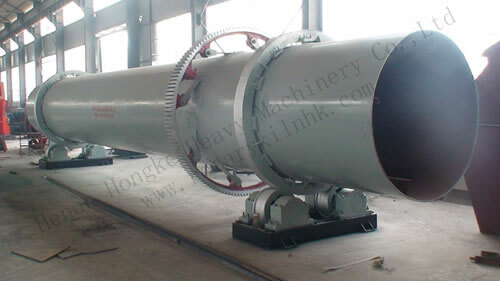 Inner wall of slag dryer barrel is equipped with lifting board. Its function is to lift material and spread increase contact surface of material and air flow so as to improve drying rate and accelerate material. 6. After heat-carrying agent is dried, cyclone dust collector shall gather material carried by gas (heat-carrying agent is generally divided into hot air and fuel gas). 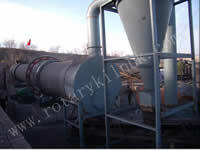 For further reduction of tail gas dust load, it can be discharged after passing bag-type collector or wet collector.